When I was a kid my grandmother made the most delicious doughnuts. There was no Tim Horton’s then! 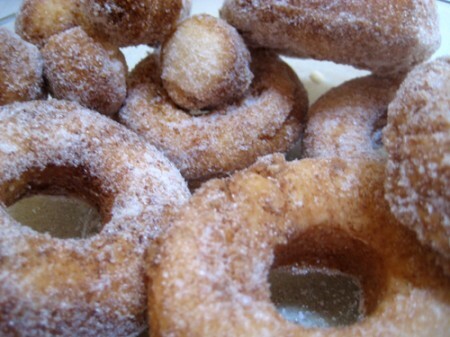 She made cake versions, and in my mind still these are the doughnuts I love to eat. My grandmother always had these covered in sugar in a cookie can for us. There was never any variation, and in my mind this was because they were perfect!. They were always spiced with nutmeg and dunked in sugar. My grandmother’s recipes live in various versions in my family. My version has no amount of flour, you were just supposed to know when the dough was right. I used to make them at Christmas as a treat for my children, who looked forward to helping make them and eating them. I rarely make doughnuts now due to calories and also because my husband, one of the fans, has to have gluten free now. So with this challenge, I made a gluten free version. I did not use the daring bakers gluten free recipe because it has mainly rice flour, which I cannot use due to allergies. So I used a recipe directly from The Gluten Free Kitchen by Robin Ryberg (See my gluten free section for information about this book which I recommend as a first intro to baking gluten free). I will post the recipe later.There were so good you could not really tell they were gluten free. Mmmmmm….good thing I did an hour of walking this morning! This entry was posted on Tuesday, November 2nd, 2010 at 7:16 am	and is filed under Daring-Bakers, gluten-free. You can follow any responses to this entry through the RSS 2.0 feed. Both comments and pings are currently closed.